Canoe camping/fishing/birding trip at Dallus Creek, any advice? My wife and I will be driving down from southern Illinois with the goal of camping for 2 nights on Dallus Creek to celebrate our 10-year wedding anniversary just after New Years. One of our first trips together was camping on the Gulf down in the 10,000 Islands and we both miss living in FL very much. I am a "planner", so I have been poring over paddling guides, maps, charts, fishing reports, and anything that I can find about the area. I have already figured out that we will want to do the trip from the ramp to the campsite near the mouth during high tide to save ourselves a lot of dragging. I plan to arrive near peak high and ride the tide out, and also plan to head back to the ramp just before peak high to ride it in, assuming that the times are fairly close to those for nearby stations like Steinhatchee. I also already booked the campsite for both nights through the FWC. We will likely be taking my 16' fiberglass canoe, assuming that we shouldn't encounter much for wave action other than outside the mouth of the creek and from boat wakes. Sounds like there may be a lot of boat traffic, so I'll likely rig up a flag or something since the canoe is flat black. Life jackets while in the canoe of course. I will put the fishfinder and an anchor in the canoe so we can find deep holes if it is cold. Will bring some soft plastics on jigs and some sinking plugs. We will likely also bring waders to walk around and fish the shallows if it's not man-eating mud. My wife is a geologist who is always interested in checking out the critters in the seagrass beds, and I majored in marine biology, so I'm sure we'll be nerding out in the shallows too. Not living near the ocean is a drag. I am currently doing my graduate work in wildlife with a focus on birds, and she also enjoys birding, so we will also likely try to paddle around to find some birds. I'll have the camera in a Pelican case for scenery and wildlife. I will be bringing a PLB, plenty of warm gear in dry bags, thermacells if it looks like it will be above 50 degrees, and other boating/camping safety gear. I'm really excited to get down there and enjoy some time on the coast, even if it is right in the middle of duck season up here There's just something about the ocean that is hard to beat! If anyone sees anything that I have really wrong in my plan, I'd appreciate your feedback. I am not trying to get fishing spots, as I know that's not cool. Rather, just trying to make sure that I don't take my wife down there and get us in a bad spot somehow. Please PM me or email me at [email protected] if you'd rather do it that way. Have some sand gnat medicine. And some DEET. And hope you don't need it. Sounds like a great adventure. Hope you get decent weather, and do remember the DEET. There's a place to camp at Dallus? Don't worry about tide too much in a canoe. Only the most extreme low tides will be problematic and you can always get out and drag. Definitely come watch for boats tho, guys like me pretty much don't have a choice but to run that creek at speed since it's so shallow. Lots of airboats frequent that creek too so just be careful. The area has beautiful grass flats starting right in the mouth of the creek so you'll dig the area. That's great guys, thanks! 10 year anniversary, so frisky will be on the itinerary ! Deet will be on the packing list, but yeah, I didn't think about Benadryl or Itch-Ease, so thanks. Jim, there's a site for up to 8 people with up to 4 tents. It can be booked through FWC on the Big Bend Saltwater Paddling Trail site. 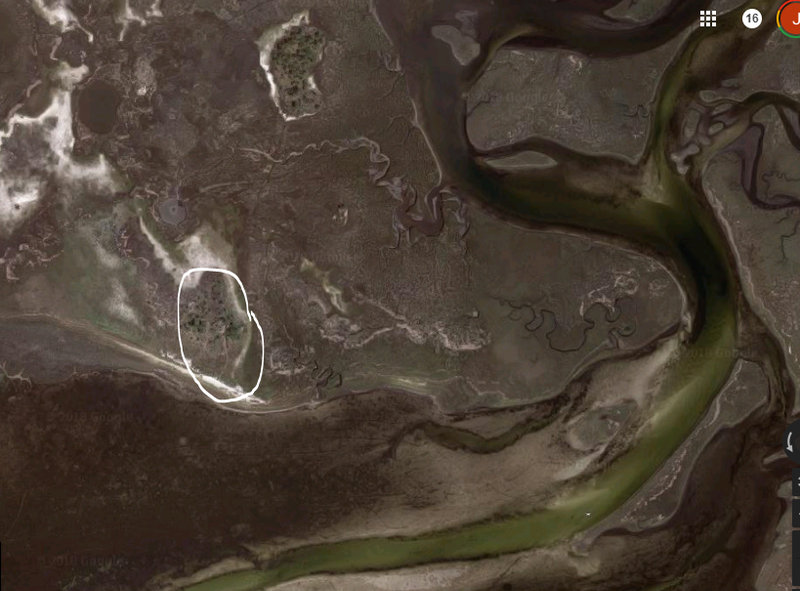 As far as I can tell, it's at the spot in the image below, but I am not 100% sure. I plan to call and ask them before I go. I'm glad to hear that the tides won't be a major obstacle. During that 10,000 Islands trip, we got marooned for a tide cycle because I didn't pay attention while making camp (picture below) and I had to move the boat way offshore in the middle of the night and swim back. The canoe is light and has been on plenty of portages, so drag/carry will work if need be. But leisurely paddle sounds much better. We will bring my old flag from running Lake O and the Glades and will keep an ear out for high-rpm sounds coming up behind us. I fully understand the need to stay on a plane when running shallow. There is a spray called No Natz. At least it works on the Sand Gnat`s for me. The Sand Gnats think I am their sugar daddy. Used to use Skin So Soft but this is not greasy. Between No Natz and the DEET you may be there long enough to get lucky. You don't want to treat the itch, you want to prevent it. The DEET does not keep the gnats off me, just the mosquitoes and the biting flies. Of course you may really get lucky and hit it on one of those days when the bugs are on vacation but that usually means wind. Also be aware that snakes are a possibility. Have a good trip. No no Knatz is ok, but you have to reapply every 5 minutes ( remember to shake it also).... someone on the forum lately said Burt’s bees wax made something that works. Dryer sheets work a little also. Dallus Creek - lots of turns and twists. Looks a good bit different on Google Earth vs. "on the water" and at different water levels. If unfamiliar I highly recommend a GPS to find your way from primitive launch back/forth to creek mouth. Snakes? Depends on the temps. Not advocating harming ANY wildlife, but...cottonmouths do NOT like the Wasp&Hornet sprays capable of reaching 25' - 30'. Gnats: Johnson's Baby Lotion vanilla oatmeal works pretty well (if you don't mind smelling like a freshly-changed baby). I fish out of Dallus quite a bit. The dates you are going to be there the tide will not be an issue. Hopefully it will be cold to keep the pests at bay and the trout stacked up in the creek. You should be able to catch all the trout you want in the creek if it has been cold. Also the wash that runs out from the creek mouth is a good start. You will not have to go far to find fish. Soft plastics on a jig head with a slow presentation. When entering Dallus from the Gulf right at the first turn to the 2nd turn is the deepest section. You can post up in there or move until you find the fish. The advantage you will have is being able to get into the creek when it is dead low. Everyone coming from the Steinhatchee River will have to wait for the tide to come up. You will figure out quickly it is not a secret spot. Everyone generally plays nice in tight quarters. Have fun and good luck. nothing to add that hasnt been mentioned accept lock your truck doors, leave nothing in the back and put a flag on that canoe. its a great place to catch fish. from the mouth northwest up to long grass point should be on fire! also when the water is low fish the ancient creek bottom coming out of dallus until the big elbow. This is correct, you are supposed to register to use the camp site in case there is another group using it. They don't recommend canoes for the trail but if you are just going out to the camp site then that may be okay. If they catch you there they could make you leave of fine you. I have done it once, we were going to start at Ecofina and camp at Dallus and then end at Steinhatchee but, my nephew broke his wrist before the trip so all we did was launch at Dallus and camp there. We had a great time anyway. Good luck and take pictures! Again, thanks to y'all for the input! Surfman, we registered online for the site and so far, every date in Dec, Jan, and Feb showed availability, and we'll be there during the week, so I hope there won't be any issue. We may also take kayaks instead. RWaters, I like that! I had mostly planned to fish the deep spots and got some hints that it may be rod-tip to rod-tip out there if the bite is on. We will take your advice and get out in the mornings while the tide is down in an attempt to beat the crowd. Then move out to the shallows as the water comes up for "tidepooling" and to maybe find any fish that are trying to soak up some sun. YakAddict, I will take my Garmin and 2 phones preloaded with imagery and the Navionics app. We will also bring a hiking compass and a map. Doesn't look like it would be a comfortable place to get lost. All others, I will research those various elixirs and potions for the gnats. I've been using Cutter's lemon eucalyptus stuff with some success, but will come armed with an array of options. I spent a few nights at Sebastian Inlet SP during high-school spring break in '01 and it was torture, so I want to avoid that. It doesn't really get much use but, rules are rules. I made up a flag for the canoe tonight. It is 6' from the waterline to the top of the pole. Big 24" orange flag. Spot to mount a nav light. Do you think that will be visible enough? I'm afraid to go too tall because then the conduit will exaggerate any rocking or rolling of the canoe. That’s a huge flag. Airboat flags are like 12”x 10”. I would think a 12x10 would work on a fishing pole with some zip ties. If you don’t get in a blind turn behind a high bank I would think your flag is fine. Don’t overload your canoe. A year ago I ask the forum if there was anything that would even slow down the no see ums. Near the bottom, Smokedog gave a new recommendation. I haven't been back where I needed to try it yet but I have a can on standby in my boat! Let us know how it works for you! Fish the grass flats because of to much fresh water coming out of the rivers. On my last trip I was catching freshwater bullheads where I normally only caught saltwater fish before. When we moved to the flat we started getting trout. Have fun. Bud, I already picked up all of the recommended concoctions listed earlier in the post, but will keep my eye out for a Dollar General on the way. We will also wear long sleeves and buffs with permethrin. Moon Shadow, thanks for confirming my thinking. We will enjoy wading and paddling the miles of shallow waters. I saw your awesome pictures and hope to take some while we are out there. Man, I miss the salt! Since you are both interested in birding, I thought I would mention that there is a pair of mating bald eagles about 1.5 miles up the Steinhatchee River around the sign warning that there are rocks ahead. And a two sided kayak paddle on the stern is a great tool to have in a canoe. Hey all! We had a great trip. The fishing was a bit slow for us, but we had the campsite to ourselves, perfect weather, little-to-no bugs, and lots to see! Thank you very much for your help! Probably should have put a few of those fiddlers on a hook. May have improved the odds. Great pics. Thanks for adding the update and blog. Looks like a great trip. Loved the blog of the trip. I even read some of the others. Glad you got to enjoy what we have in our backyard. StankBait, I learned that after the fact I was telling my mom, who used to own a bait shop in Indialantic, and she said "oh yeah, we used to buy fiddlers from Steinhatchee all the time, they make for great bait!" Not sure Laura would have gone for it, anyway. Billy, thanks. I spent my first 25 years in Florida (Miami and Melbourne) before moving to Canada, and now Illinois. I have no idea where our professions will take us after grad school, but any job in FL or even the SE US coast gets serious bonus points from Laura and I.
Glad you had a great trip and thanks for posting. The benefit of going camping in Florida in the winter is both the cooler weather and reduced bugs. You have to be careful reaching in the bucket to grab the fiddlers. You might not get them but they will get you. For some reason they always seem to be mad about something. Maybe they just don't like going fishing. Enjoyed the posts.